Abu Dhabi has officially been selected to host the 2019 United Nations Industrial Development Organization (Unido) General Conference (GC), the organisation’s supreme policy-making organ which convenes every two years. The announcement was made following a vote by the 53 member states of the Industrial Development Board (IDB) at their 46th annual meeting in Vienna, Austria, where they convened to review the implementation of the Unido work programme, approve budgets, and make recommendations to the General Conference on policy matters, said a statement. The consensus is a testament to the growing confidence in the UAE’s role in shaping the future of manufacturing, and its development of a robust industrial base as part of a national vision for a diversified, knowledge-based, highly productive and competitive economy. Since becoming a specialised agency in 1985, Unido has never hosted the General Conference in the Middle East, and only hosted it away from its Vienna headquarters three times: in Bangkok, Thailand (1987), Yaoundé, Cameroon (1993), and Lima, Peru (2013). Unido and the UAE have a long-standing relationship, with both serving as co-chairs for the Global Manufacturing and Industrialisation Summit (GMIS), the world’s first cross-industry platform that gathers leaders from public and private sectors and civil society to harness the Fourth Industrial Revolution’s (4IR) transformation of manufacturing to the regeneration of the global economy. The platform has seen Abu Dhabi emerge as a leader in driving this transformation, and hosting the UNIDO GC will build on its continuous efforts and initiatives, which seek to shape the future of manufacturing while promoting industrialisation for poverty reduction, inclusive global development, and environmental sustainability. The General Conference is scheduled to be held at the end of 2019 and will be preceded by Unido’s Least Developed Countries (LDCs) Ministerial Conference. As the world’s largest donor of official development aid relative to national income, a leader in smart strategies, and a strategically positioned geographic location between East and West, the UAE has continuously demonstrated its commitment to contributing to the achievement of the UN Sustainable Development Goals (UN SDGs). Home to the ministerial Fourth Industrial Revolution Council, a first of its kind in the world, and co-chair to the Global Manufacturing and Industrialisation Summit, hosting the Unido GC in Abu Dhabi will allow countries to benefit from a global pool of capabilities and enhance their understanding of, and preparation for, the impact of the Fourth Industrial Revolution. According to data from Oxford Economics, from 2007 to 2017, the UAE’s industrial sector (which includes extraction, manufacturing, utilities and construction) has grown by more than a third, and is forecast to grow by another third over the next decade. An integral part of the global supply chain, companies in the UAE such as Strata Manufacturing, the region’s only aircraft parts manufacturer, Emirates Global Aluminium, which was the world's largest 'premium aluminium' producer in 2017, and defence vehicle manufacturer NIMR Automotive, have proven their capabilities and evolved into global players in knowledge-based and cutting-edge sectors. “The UAE remains a pioneer in the Fourth Industrial Revolution and continues to bridge and connect civilisations between the East and West. Through its partnership with Unido in the Global Manufacturing and Industrialisation Summit, the UAE is well-positioned to play a strategic role in shaping the future of the global manufacturing sector,” he added. 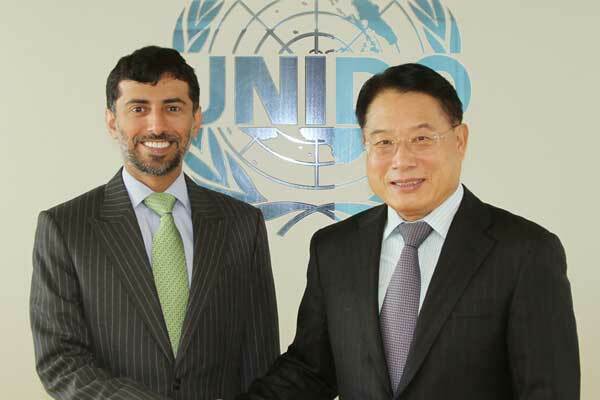 “I look forward to further strengthening our ties, especially since UNIDO and the United Arab Emirates share the commitment to take a transformational approach towards shaping the future of manufacturing and jointly co-chair the Global Manufacturing and Industrialisation Summit,” Yong added. “Our founding father, the late Sheikh Zayed bin Sultan Al Nahyan had the vision to leverage oil wealth to build a prosperous nation and enhance the welfare of UAE citizens, developing what are now world-class healthcare and education systems, and a globally competitive economy. This vision, however, was not exclusive to the people of the UAE; in the midst of the country’s renaissance, it arose as a leader in international cooperation and in the provision of humanitarian relief and development support to those less fortunate across the world,” he said.